Those of us who are following the news are most likely under the impression that we’re living in one of the worst times in history. Practically everyday you hear about the dangers of nuclear weapons, terrorism, financial bubbles, incompetence political leaders, corruption, racism, economic stagnation and recessions, poverty, food shortages and much more. With all the negativity, it’s very easy to have a grim view of the world. 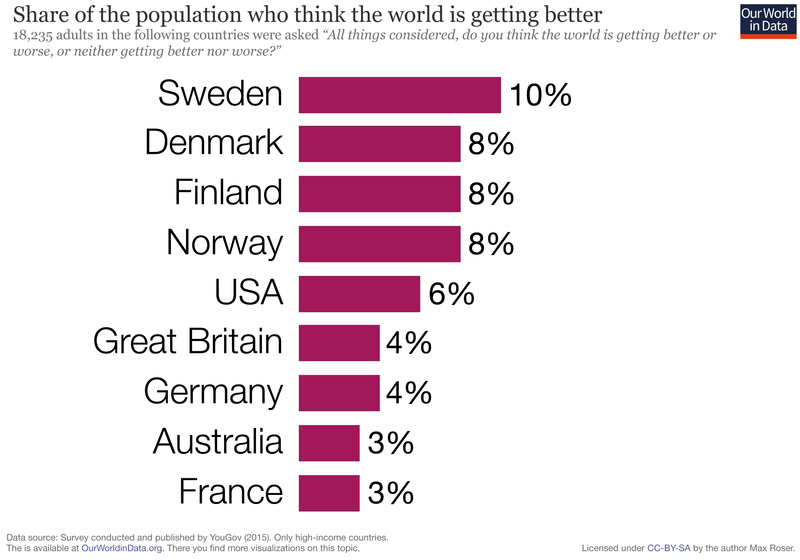 In fact, a 2017 survey showed that only 6% of Americans thought the world was getting better. It’s alarming so many people are pessimistic about the state of our world, but they can’t be blamed because they are constantly bombarded with negative information. The good news is that in reality the world is significantly better today than anytime in history. In a powerful study entitled “The short history of global living conditions and why it matters that we know it” by Max Roser, an economist at the University of Oxford and the founder of Our World in Data, we learn that in key elements of human well-being — poverty, literacy, health, and freedom — the world is an extraordinarily better place than it was just a couple of centuries ago. The study shows that our increasingly pessimistic view of the world is completely false and we know little to nothing about the reality we live in. A lot of people are under the impression that poverty is unsolvable and that a large number of our global brethren are going to be in it for the rest of their lives. However, people might be surprised to learn how many people are actually struggling with poverty around the world. If we go back 200 years, there were only a lucky few that were not living in extreme poverty. The World Bank defines extreme poverty as earning less than $1.90 a day. People have their quarrels with industrialization, however, increased productivity allowed more people to escape extreme poverty. The most stark gains to reduce poverty was made in the last 70 years. In 1950, about 64% of the world’s population was estimated to be living in extreme poverty, a number that has fallen to around 10% today. This an even more impressive achievement when we realize the world’s population has increased from 2.5 billion in the 50s to 7.7 billion today. According to the study, since 1990, 130,000 people escape poverty everyday. The increase in globally literacy rates is just as impressive as our success in reducing poverty. In the last two centuries, the world has gone from literacy being reserved for a tiny few to around 9 in 10 people being to read and write. Over the last 65 years the global literacy rate increased by 4% every 5 years — from 42% in 1960 to 86% in 2015. This trend isn’t slowing down, because younger generations are progressively better educated than their older counterparts. This trend is driven by the increased quality and availability of education around the world. The news doesn’t get any less exciting when it comes to global health. In 1800, the newborn death rate was around 40%, today only a small number of children die before the age of 5. Life expectancy was similarly low in the 1800s, with people expected to live between 40-50 years. Average world life expectancy was 72 in 2016, according to the World Health Organization. A big reason for this is innovations in medicine, particularly the discovery of germs and the creation of vaccines. However, even more important factors that have improved global health are better housing, sanitation, hygiene and diet. Freedom might be the hardest to measure, but it definitely has made progress. There has been a lot of talk about the rise of populist leaders and autocrats nowadays, however, there have been strong gains in human rights across the world, such as The Universal Declaration of Human Rights ratified by the United Nations in 1948. In the 19th century almost everyone lived in countries ruled by autocracies, while today more than half of the world lives in a democracy. It should be noted, four in five people who live under an autocratic regime live in one: China. With the vast strides we have made in bettering the world over the past two centuries, it is ironic how most people are ignorant about how much the world has and is continuing to improve. According to the survey, the media has to take part of the blame. This is so, because the media doesn’t inform people how the world has changed, but rather what in the world has gone wrong. Newsrooms tend to focus on singular events, which are usually negative. By contrast, positive developments happen gradually and have no shock factor to garner readers. Just like you, journalists are also human and have a pessimistic view of the state of our world. With all this positivity, we have to still remember we haven’t crossed any finish line. Having around 1 in 10 people in extreme poverty is something we need to address because even if the number is low, we can do better. The impact on the environment is not sustainable and it needs to be addressed yesterday. Threats to political freedoms and human rights need to be dealt with and not ignored. The gains we have made are by no means assured and can disappear in the blink of an eye. However, there should be a healthy level of optimism for the future. People are more educated and knowledgeable than at any point in history, more people have opportunities to have a voice and we live in a much more global and interconnected world than ever before. We should all be thankful to everyone in the past that got us to where we are, and strive to make the planet a better place for future generations.